If you use the Google Chrome web browser to access Canvas, you can use Chrome's speech recognition feature to leave text comments on student assignments in the SpeedGrader. Chrome's speech recognition feature turns your spoken comments into text comments. Chrome speech recognition will default to the preferred language set in your Chrome settings. To change your setting to a different language, view your language settings in Chrome. 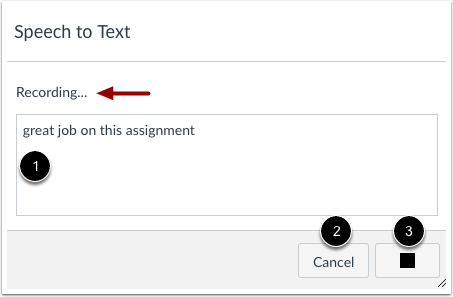 In the Assignment Comments area, click the Microphone comment icon. The dialog box indicates that the feature is recording your comments, and text box will convert your speech to text in real time . 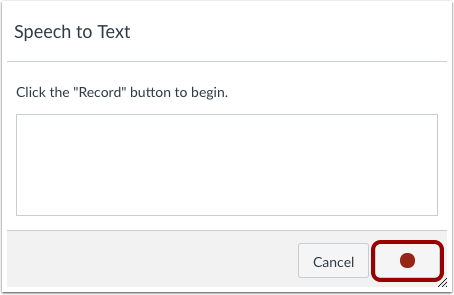 If you want to re-record the converted text, click the Cancel button . Otherwise, apply the recorded text in SpeedGrader by clicking the Stop button . If necessary, modify your text in the comment box. Then click the Submit Comment button. If you navigate away from a SpeedGrader page before submitting your comment(s), Canvas generates a message warning that you have unsaved comments on the page. 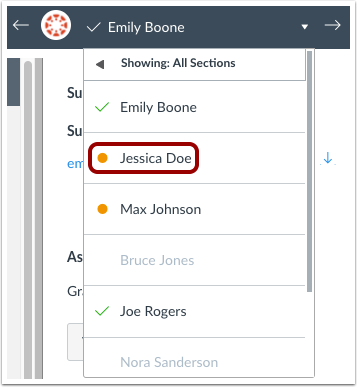 Note: This feature only applies to leaving the SpeedGrader page; it does not apply to the comment field for each student submission. If you create a comment for a student but do not submit it before viewing another student submission, SpeedGrader retains the comment in the comment field for the second student—and any student—until the Submit Comment button is clicked and the comment is officially submitted as part of a student’s submission. Previous Topic:How do I download submission comments as a PDF in SpeedGrader? Next Topic:How do I review moderated assignments in SpeedGrader as a moderator? Table of Contents > SpeedGrader > How do I use Chrome's speech recognition feature to leave a comment in SpeedGrader?